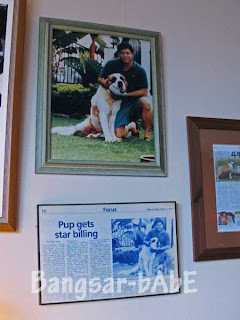 Champ’s Bistro – damn blardy SHIOK! After having the Champ’s lunch set about a week ago, Richard invited me to sample more of Champ’s specialities last weekend. Since it was impossible for me to tackle so many dishes alone, he suggested that I invite some friends along. So we (Shum, Mike, rif and myself) all went with great anticipation. Got there at 12.45pm and Richard was already working his magic in the kitchen. 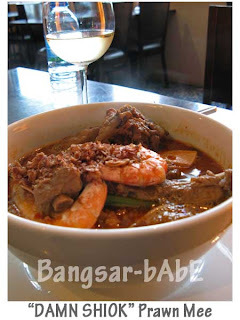 This time around, I had the ‘Damn Shiok’ Hokkien Prawn Mee as it was the most famous dish in Champ’s. Mike had the Chee Yuk Fun while Shum and rif both ordered the Char Kway Teow. Richard got us started with his special creation (not on the menu). 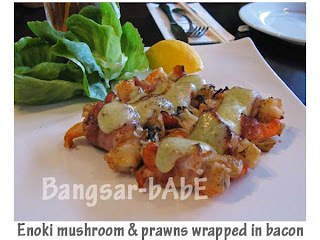 Prawns and enoki mushrooms wrapped in crispy bacon and topped with wasabi mayo. 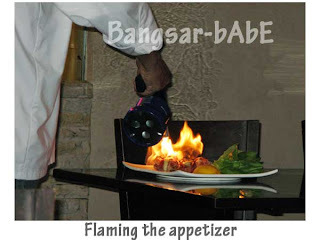 He flamed the dish before placing it on our table and squeezed in the lemon before we sank our teeth into it. Tender mushrooms and bursty prawns encased in thin, sinful bacon, the wasabi mayo made the whole combination utterly delicious. Richard ordered a bottle of house chardonnay to go with our incredible porky meal. 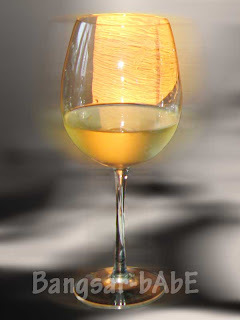 The chardonnay was rich with a fruity undertone. Each sip was sweet with a perfect balance of tang. Very crisp and smooth to drink. 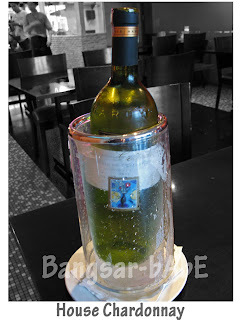 We had 2 bottles of these – and I believe I polished off one whole bottle (or more) myself. 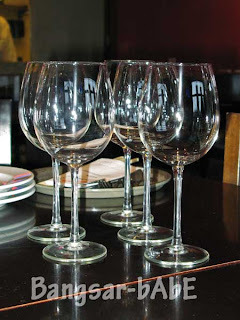 The waiter kept topping my glass till I lost count. Hick!! The ‘Damn Shiok’ Hokkien Prawn Mee was damn shiok indeed! The bowl was huge and so was the portion. 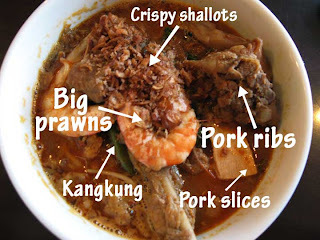 I seldom order prawn mee as the I find the broth often insipid and disappointing. This bowl was in a league of its own. Thick, just the right amount of spiciness and a glorious red hue, every sip of the broth was a gastronomical delight. It was the nicest home-made stock I’ve tasted! Topped with big fresh prawns, underneath revealed the most generous amount of pork slices, kangkung, shrimps, 3-4 pieces of huge ribs, crispy fragrant shallots and LARD! And plenty of noodles too. I offered the rest a sip of my broth, praying that they wouldn’t ask for more. 😛 The ribs were delightfully tender and full of aroma. The pork lard was very crispy, but since it’s PRAWN mee, the lard quantity wasn’t as much as the ones in the pork noodles. The prawns were fresh and succulent, as if they were thrown into the hot broth alive. This is the most expensive and best tasting prawn noodles I have eaten! Considering the portion, quality and generous ingredients, the RM 20.90 price tag was more than justified. Mike’s pork noodles were just as good as the last time I had it. Richard always ensures there’s quality control for all his food. All his chefs are well-trained and he will not allow anything below par to go out of the kitchen. Mike gave me ALL his lard toppings. 😀 The Char Kway Teow was quite good. It had all the criterias a good plate of Char Kway Teow should have. Served on banana leaf, the kway teow was fried with lap cheong, DUCK EGG, see-hum, big prawns, lard, chives and crunchy beansprouts. On top of that, it came topped with crab flakes. The kuay teow was fluffy with seasoning distributed evenly. The see-hum was cooked just right – it was plump and juicy. The addition of duck egg gave the CKT the extra ooomph!! Fragrant and richer in texture. The prawns were fresh too. Portion was rather huge. And the “liu” was aplenty. 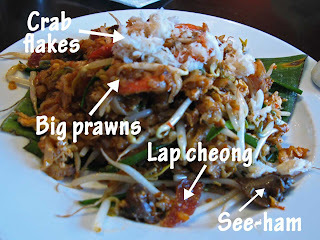 What more could you ask for in a plate of Char Kway Teow? All the right ingredients, no faults on taste AND I get to eat it in an air conditioned restaurant WITH crisp white wine. Beat that. Halfway through our meal, the stinging bacon came. 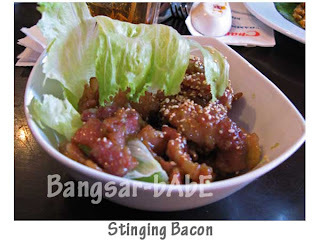 Cooked with wasabi mayo and garnished with sesame seed, the bacon melts in your mouth with its crispy edges and melting pork fats. The wasabi flavour gave the bacon a “kick” and I loved every moment of my eyes watering and nostrils tingling. SHIOK!! Richard brought me another bowl, since I loved it so much. 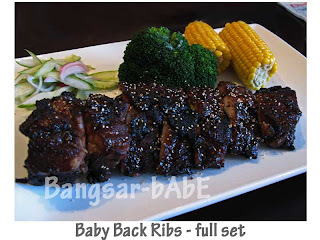 *shy* As if all the food above wasn’t enough, Richard asked his kitchen staff to bring us a full set of baby back ribs. Served with broccoli, corn and pickled vegetables, it was a huge portion. 8 big slabs of ribs, and I had 4! 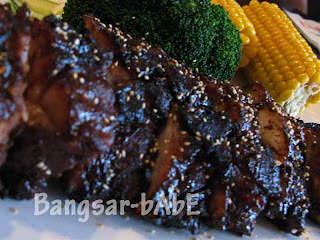 The ribs were marinated overnight and was flavourful right down to the bone. No sauce was needed. The meat was tender and juicy. It required very little chewing as the meat “melts in the mouth”. I didn’t bother with the cutlery Richard provided me, I devoured the meat with my bare hands. Finger-licking good! 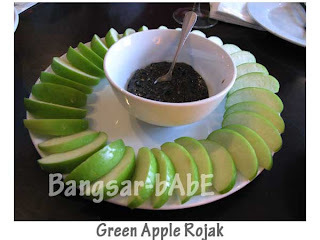 We also had the green apple rojak. The rojak sauce was piquant and very addictive. Made with premium quality prawn paste, sugar, belacan and chili padi, it was very tasty with crunchy green apples. Very refreshing…especially after all the pork we had. Lunch was impeccable. The food was great but what made the whole evening perfect was the generous hospitality of Richard. Very accommodating with plenty of jokes and stories to share. We had a wonderful time. Thank you so much for such a lovely lunch! omg..im definitely visiting this place soon..top of my priority list liao! kok: Yes…it really was an awesome lunch. Full of porky goodness!